Swap partners emailed once I get a chance to do it but I post on my blog once I have done them. I am so glad you are doing it again. Thanks. 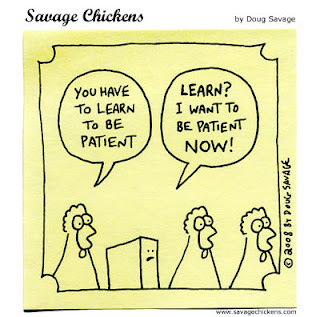 That patient chicken cartoon cracked me up- so funny! Good on you for organizing such a great swap. I won't be joining in because I've got too much on the go, but it'll be fun seeing it pop up on different blogs . Yeeey! so excited- you are a true angel! I did this swap a few years ago it was fun....now I have my mojo back am I ready to commit... Yes of course!! Will email tomorrow !! What a good news !! It was a fantastic swap to be a part of last year........I will email you. Thank you Chooky! I followed the swap with quiet envy last year. However, I can't see myself being organised enough this year, maybe next year when I am retired!! Goodness me, Donna, so efficient - will be lovely thanks for all your hard work! I've been having little thoughts about it all. Hi Chooky, I've been thinking about joining in on a Xmas Swap, now I'm just hoping i can join this one. This is great! oh, & i love the chickens being im/patient! Will have to watch from a distance AGAIN! Cant wait to see all the lovliness and creativity. It wouldn't be Christmas (or Fall, for that matter) without it. 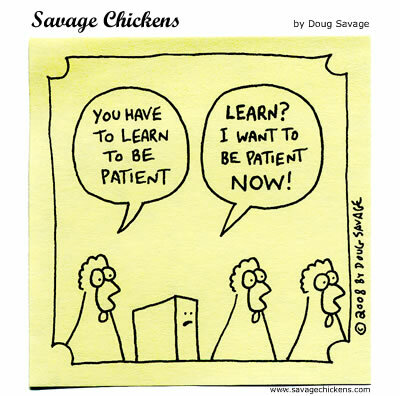 I can completely understand those (im)patient chooks!! That was me. . .I was one of the "pests" asking if there was going to be a SSCS 2012! Email sent. . . .I have had a wonderful time with this swap every year that I have taken part. I'm sure this year will be no exception. I have been waiting patiently for you to post about the swap! I have sent out my email to you. And I know this year will be as fun and exciting as the previous years! The yellow blooms on your header are so pretty! What type of tree/bush is that? I have watched this swap from afar for several years. Perhaps I could join in this time? A little bird told me it was someone's birthday. So Happy Birthday Chooky! I hope you have a lovely day. Happy Birthday. I wish you health and a lot of love. Happy Birthday Chooky,hope you have a great day. such a great swap but too many commitments this year.....have a very sad face right now :(.... never mind......that cartoon is a crack up so cheered me up! hope you're having the most wonderful birthday day too.....lots of spoiling in order!!! Many happy returns of the day, hope you have a fun filled day. Hope you get spoilt rotten...and have cake.Yum. Happy Birthday to you, happy Birthday to you, happy birthday dear Chookybluuuue, Happy Birthday to you!! Heard it was your birthday today..so a very Happy Birthday to you..hope you have a fabulous day..
WOOOO HOOOOOO! Such a great swap! Thanks for hosting this! Hugs! Have I really missed this blogpost while being on vacation!!!!!!!! Is it to late or do you have a spot for me this year too. I would really love to join the SSCS swap this year too.